PinkyPiggu: Looking For Your BEST BEEF BOWL In Singapore? Here Are 25 Places To Try! 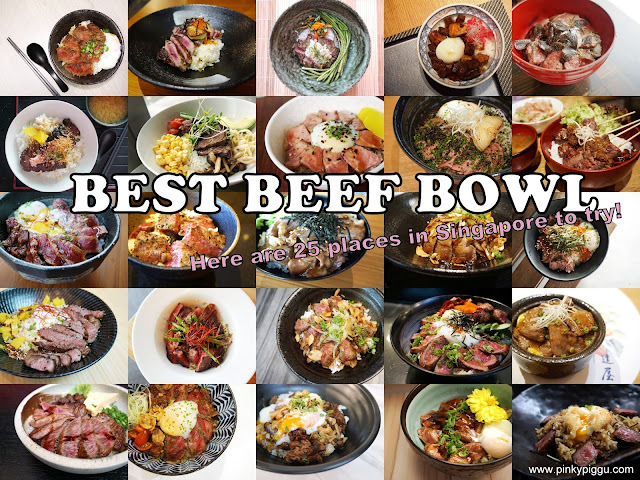 Looking For Your BEST BEEF BOWL In Singapore? Here Are 25 Places To Try! 25 Beef Bowls! PinkyPiggu ate them all! "Beef bowl" literally means "Gyudon" in Japanese. It is a dish consisting of a bowl of rice topped with beef in savory-sweet sauce, and is popular in Japan as a fuss-free and affordable meal option. Though beef bowl is essentially a Japanese dish, it is not just limited to Japanese restaurants which serves them. In Singapore, we can find beef bowls in cafés, and even hawker centres too! Being a beef bowl lover myself, I couldn't resist ordering a bowl each time. Many places nowadays uses Wagyu (Japanese beef) which is known for their well-marbled meat, and more often than not, fancified it further with the addition of onsen egg, foie gras, truffle oil and even freshly shaved truffles! The satisfaction of having a beef bowl luxuriating with quality ingredients yet fills you with a touch of comforting hominess in each mouthful is unexplainable. You don't know what you're missing, until you've tried a bowl. There are too many discouragements and disappointments in life which take away the joy of living at times. Let's just sit back and enjoy the simple pleasure of eating. One bowl at a time. So, which bowl is PinkyPiggu's personal best and favorites? It shall be revealed at the end of this post. But first, the 25 beef bowls (listed in alphabetical order). The Steak & Foie Gras Donburi has all the right boxes ticked. It may not feature the most premium cut, but the grass-fed sirloin steak was juicy and cooked to a perfect pinkish center. Reasonably creamy duck liver. Good quality rice drizzled with their special homemade Babette sauce. Exquisitely plated for a rice bowl dish. At this price, it was unquestionably an affordable indulgence. Read: Babette ~ A French-Japanese Restaurant & Bar At Parc Sovereign Hotel, Singapore. BEST Matcha Lava Cake Ever! The Wagyu don would have been visually perfect, if not for the prematurely broken onsen egg when it arrived at my table. Nevertheless, the runny egg enveloped the rice with an enjoyable creaminess, and I love the light sprinkling of sesame seeds which gave the rice an added fragrance. Boredom set in as I was halfway through the bowl (the rice portion was a tad generous for my appetite), but the star was undeniably the Wagyu beef slices itself. Hot off the grill with a beautiful browned exterior and medium rare tenderness with an alluring smokey aroma in every bite. Certainly moreish! Read: Chotto Matte @ Blair Road, Singapore ~ Delicious Sushi & Japanese-inspired Food! I was skeptical about this beef bowl when I saw its photo on instagram. It was unusually topped with err... Ikura (salmon roe)? But the chef explained that the concept is of a "land and sea pairing" and "the saltiness of the ikura will nicely impart some flavor to the plain onsen egg". A quick sear on the pan gave the pieces of Miyazaki beef a medium-rare doneness with slightly browned edges, and retained the tenderness and juiciness of the meat. Served with warm, premium koshihikari rice dressed in light soy seasoning sauce, the combination of ikura with beef bowl did not taste as exotic as I imagined, and was quite acceptable in fact. Memorable for its uniqueness. The cubes of Wagyu beef were grilled to medium rare, tender with a pleasurable bite but somewhat lacking in desirous smoky aroma and not exactly wow-inducing. Though the beef has its imperfection, I enjoyed the beef bowl as a whole. The foie gras was fatty and rich in texture, the runny onsen egg imparted a lovely creaminess to rice, the ratio of rice to ingredients was just about ideal, the sauce tying all different components together was tasty. There was a sense of comfort in each spoonful. Read: Fat Cow @ Camden Medical Centre ~ Is This The Best Beef Bowl In Singapore? The Hokubee Ribeye Don had my friends and I gushing over its deliciousness! A bowl dish brimming with Japanese rice spiked with doses of furikake, lightly seasoned with rice vinegar and topped with 200 grams of thickly-sliced Hokubee beef and 63° egg oozing with yolky creaminess. Though the Hokubee beef is not a premium cut, being injected with soluble oil to yield a more desired marbling and is often refered as "poor man's Wagyu", it nevertheless won us over with its melt-in-the-mouth juiciness and well-charred exterior. Read: GastroSmiths Bistro & Bakery @ Tan Quee Lan Street, Beach Road ~ One Of The Best New Openings This Year (2014)! The grilled Wagyu Japanese A5 steak was thinly-sliced and fanned out beautifully over Japanese short-grained rice, adorned with toppings of onions, pine nuts and fried garlic chips. Unfortunately, the sauce was overly sweet for my liking, and overwhelmed whatever flavor the meat should have, which I felt is a waste of the premium cut (and my money). It might appeal to you who like your beef bowl saucy though. Haru means "Spring"in Japanese, an optimistic season of new beginnings and new life. Taking over the space which used to house Kinsa Sushi, I couldn't help but noticed the similarity between the two Japanese restaurants. Besides identical items on the menu, both their Wagyu Don featured pan-fried Kagoshima Wagyu (A4 grade) beef over rice with onsen egg and miso soup at the same price. But I must say the bowl at Haru Haru was a tiny notch more enjoyable with beef that was better executed. Meat came with well-seared edges and a still pinkish center, retaining a juicier bite. Love the fried garlic chips which imparted a nice touch of aroma and added texture. I wish they had served an intact onsen egg instead of the one you see in the picture. Even though it's meant to be broken anyway and mixed into the rice, it suggested a lack of kitchen quality check for consistency. Still a good choice if you stay in the northern heartlands and do not want to venture into town for your beef bowl. This is one of the bowls that brimmed generously with 120gm of Australian Wagyu! Cut in slices, as well as cubed, the sirloin provided two different mouthfeel in a bowl. Rice portion was hearty, and topped with an onsen egg and two pieces of tamago roll. Uber satisfying for a huge appetite. I looked at Jin's menu and deliberated for quite a while. The bowl of Saga Wagyu Chirashi is undeniably expensive, but my heart kept urging me to just go for it! Using Saga beef which is considered to be one of the top Wagyu brands, the intensely-marbled sirloin slices were enough to make me salivate just by looking at it. Lighted seared over low heat till the outer turned to gorgeous shades of brown, the inner still retained its meaty pinkiness interspersed with fats that burst with flavors and juicy blissfulness at each bite. The trimmed fat was cut into tiny pieces, and pan-fried to a crisp texture, much like the beef version of pork lard. Premium Hokkaido rice is used, accompanied by sweet shiitake mushrooms that is braised with wintermelon, and two pieces of egg roll. The entire combination was utterly sublime, without a need to fancify it with truffles or anything more. This was pure beefy goodness at its best! My current personal best! For a moment I wondered if I'm eating a vegetable bowl or beef bowl lol! Brimming with sweet corn, radishes, sugar peas, cherry tomatoes, beansprouts, avocado, shimeji mushrooms and wasabi sprouts with just a few slices of beef short ribs which did not take up my ten fingers to count, you would have to forgive me for thinking so. The beef was adequately tender and juicy with nice flavor, but the bowl felt a tad dry overall and could do with a light drizzle of sauce. Choice of sushi rice, brown rice and quinoa. Will be suitable for "health/diet conscious but still want to indulge" you. This is one of the most basic versions, with beef slices and onsen egg over rice tied together by a savory-sweet sauce. Using Kagoshima Wagyu (A4 grade) beef, it was pan-fried and turned out a tad overdone for my preference. The meat itself came across as dry in texture, but the sauce provided overall moisture and made the bowl more palatable. I have friends raving about the Wagyu don at Kinsa though, perhaps it wasn't quite their day when I went. I had to savor each piece of Kagoshima Wagyu sirloin very slowly, because there were only 6 precious pieces lol. All were so excellently fatty and luscious to bite! The bowl was made even more wonderful with lovely Japanese rice that was mixed with tiny pieces of beef, mushrooms, onion and dried seaweed in a sauce that has a great balance of savory and sweet taste. Instead of just an usual onsen egg, the poached egg here has another layer of fried crispiness enveloping that silky white and runny yolk creaminess. Utterly delicious and certainly one of the more unforgettable beef bowls I had. This yakitori specialty restaurant serves skewers of charcoal-grilled Wagyu beef over rice! It wasn't aromatic as I expected it to be when the bowl arrived, but the tenderloin cubes slowly released its subtle smokey flavor upon each chew. A tad sinewy at parts, but mostly tender with some fats. The sauce topping made of onions, leeks and "some other ingredients" was very interesting! Its texture has a crunchy bite similar to chye poh (preserved radish like those you eat with chwee kueh), a tad saltish by itself but was delish when eaten together with the rice, and made quite a unique pairing with the beef. One of the most affordable and value-for-money beef don considering its price, portion and quality. Do make it a point to go early for lunch, because it's only limited to 10 sets per day. This rather new and tiny Japanese restaurant uses Omi beef for their gyu don, which is considered to be one of Wagyu brand that boasts top class quality. Quality and flavor of the beef were unquestionable, its marbling was gorgeous, but we wondered at the slightly slimy mouthfeel. I looked out for slightly char edges and aroma, but there was none. The sauce that accompanied the beef was a tad sweet for my liking, but suited my friend, who also enjoyed the rice that has generous amount of furikake mixed in. After realizing that the restaurant offers discount on not one, but several online deals sites, my wallet felt the pain. Okay lah, at least my friend enjoyed the bowl as a whole. Taste is subjective, let's agree to be disagreeable. By the way, that yellow chrysanthemum (kiku) which is specially imported from Japanese is edible. Sumiya's version of beef bowl has 4 large pieces (yes I counted) of shabu shabu-style Wagyu blanketing a bowl of warm steamed white rice. I did like the fatty, tender texture of the thinly-sliced beef, but the gooey, overpowering, sweet garlic sauce killed whatever goodness there was. Not my kind of beef bowl, but I guess there will be some of you who like it the saucier way? If yes, then it is quite a good deal for its price, considering the substantial portion and all that you get together with the set. What can be said when I walked into Sushi Jin without much appetite or hunger but ended up finishing the Wagyu Don in its entirety? D.E.L.I.C.I.O.U.S.!!! The beef bowl's beautifully layered smokey and truffled aroma captured my immediate attention and I took an instant liking to it the moment I sent a slice of that immaculately pan-seared Wagyu beef into my mouth. It was succulent, wonderfully salted and simply yummy together with a big spoonful of rice that is drizzled with truffle soy sauce and smothered in runny onsen egg. I can have another bowl of this... and another... and another. I wasn't attracted much to the Saga Beef Don initially, judging by its minute size and haphazard presentation (onsen egg was broken and the beef looked as if it was carelessly thrown onto the rice). But like an ugly ducking, it blossomed into a beautiful swan as the scent of truffle oil and smokey fragrant came whiffing up, and the luscious flavor and texture of well-marbled beef hit my tongue. Do add those slices of shaved truffles for greater gratification. I had high hopes for Tanuki Raw's Truffle Yakiniku Don. There are many positive reviews on social media, and the beef bowl was so successful that, what was introduced as a lunch special became available for dinner as well (take note of the difference in prices though). My pieces of pan-seared black Angus short ribs arrived looking pallid, the truffle in the "dallop of truffle soy sauce" (as described on the menu) was hardly discernible, rice was excessively spiked with furikake. Maybe I shouldn't complain for the price I'm paying but I'm really puzzled at its popularity. Perhaps fans who are reading this can tell me why? How can I do a beef bowl list without trying one from Tatsuya, the stalwart of Japanese cuisine in Singapore? Like Aoki, Tatsuya's beef bowl is not stated on their menu but is available upon request. The smallest portion came in a bowl which is sized no bigger than a Chinese rice bowl. I went "huh, so tiny?" in disbelief. But the moment I put a slice of that amazingly tender, melt-in-the-mouth aburi saga beef into my mouth, I went "hmm" in gastronomic bliss. The rice was superb too! Spiked with tobiko which gave a popping, crunchy texture, it matched beautifully with the sticky grains and layer of thin omelette. Every component including the sauce were perfect, except for the portion and price. This was my smallest and most expensive bowl, but is it worth it? Definitely! Japanese Wagyu Don in a hawker centre? Why not? The newly renovated Bedok Market Place could be the hippest food centre in Singapore, with interesting stall facade and some tenants such as The Burning Oak offering not your usual hawker fare. The rump cap of marbling score 4/5 may not be the best of Wagyu cut, but it was given a befitting smokey treatment over the charcoal-grill. I only wish it was done to my requested medium-rare instead of the standard medium (uncle who took my order forgot to tell the 23-year-old chef-owner). Served over Japanese pearl rice with an onsen egg buried underneath, and topping of fried ginger slivers adding another layer of aromatics. The hearty portion and well-execution makes this bowl a steal for its price. A popular choice from the lunch menu, this bowl of Gyuniku Donburi features tare marinated skirt steak with truffle hon shimeji mushroom and onsen egg over rice. The beef itself was a tad dry and rice too hard, but the appetite whetting sauce with onions and runny egg added moisture which made the bowl more palatable. The truffle scent, though subtle, is always a welcomed addition. The Sushi Bar's rendition of Wagyu Don features premium slices of beef that is nicely seared to the perfect tender doneness and drizzled with sauce. Ooh just look at that pinkish centre! Mix the runny egg together with the rice, savor it with a bit of fried garlic, there you have it, a comforting bowl of deliciousness! Read: The Sushi Bar ~ Popular Japanese Eatery At Far East Plaza Opens New Branch At Ngee Ann City! Our bowl of truffle wagyu don looked promising with pinkish slices of grain-fed, Kobe BMS 8 wagyu rump seasoned with truffle salt and perfumed with black winter truffle oil. The sous vide beef was tender, but lacked the smoky aroma which I seek. While it is highly recommended to enjoy it on its own, we thought a generous dash of the garlic soy sauce gave a much-needed lift to the overall taste. Accompanied by an onsen egg and brown rice which gave a nutty and chewy bite, the bowl did feel "cleaner and lighter" than usual. Suitable for you who are looking for a healthier choice. Zaku specializes in sumiyaki items and dishes that embody both Japanese inspiration and international flair. Their lunch menu features a host of donburi served with premium Japanese rice, including the Wagyu beef bowl which I ordered. What is described on their menu as "wagyu cubes" came a lot thinner than I expected, and the tiny size of each piece couldn't give me a satisfying mouthfeel. The meat was grilled to a tender bite, but perhaps could do with a tad more flavor and char edges. I like the addition of yuzu koshu which provided a tinge of zestiness to an otherwise ordinary bowl. This post is based entirely on PinkyPiggu's personal visits and opinions. PinkyPiggu paid for all the beef bowls, except a few which were treats from friends.